According to the contact notes, Meier allegedly made more than 1,380 pictures from his two journeys, out of which he claims that many hundreds have been either lost, stolen, unusable (ex: overexposure, distortions, etc.) or falsified. On pg. 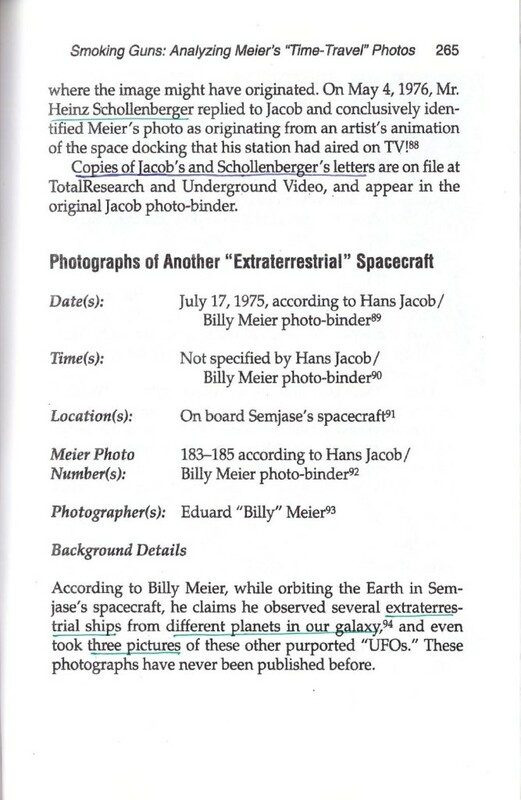 248 of his 1995 book – ‘Spaceships of the Pleiades’ – Kal Korff claimed that there are ‘more than 60’ space and time travel pictures in Hans Jacob’s (official organizer/safe-keeper of Meier’s photo and video material since 1975 before he left the Meier group in 1977) photo album. It is not clear whether Jacob possessed, all or most of the space and time travel pictures (probably in hundreds) allegedly photographed by Meier or only a part of them. Out of these ‘more than 60’ pictures, Korff combinedly addressed a total of 22 pictures in his 1981 and 1995 books. 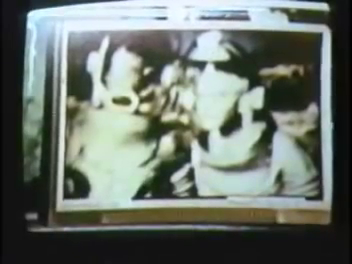 In April 1998, Randolph or Randy Winters gave a lecture about the Meier case at SHIFT (Sharing Information on Fringe Topics – a speakers forum in the San Francisco Bay Area), during which he showed a video he made at Wendelle Stevens home around 1987 or 1988 (personal correspondence with Randolph Winters), with both of them flipping through Wendelle’s photo album containing Meier’s pictures from his space journey. 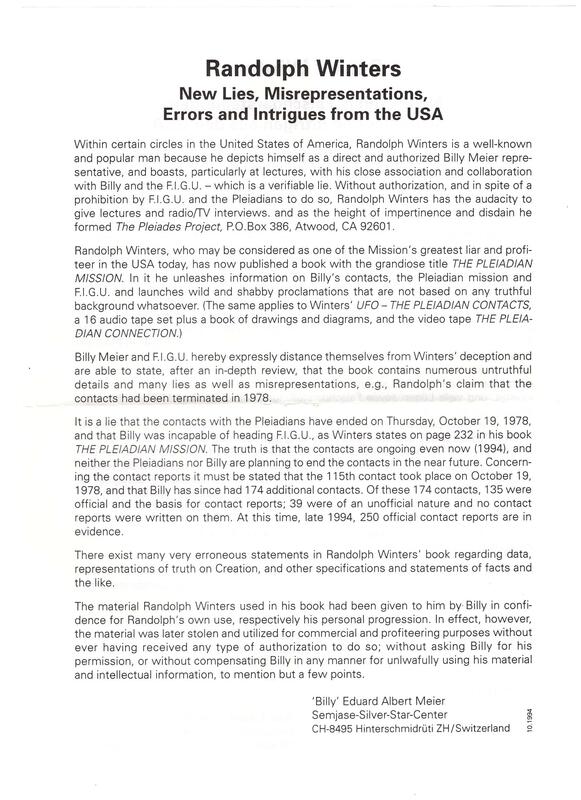 It should be mentioned that FIGU had already distanced itself from Randy Winters by the time of this lecture, as becomes apparent from this leaflet distributed by FIGU in October 1994 titled – Randolph Winters: New Lies, Misrepresentations, Errors and Intrigues from the USA ( Randolph Winters: Neue Lügen, Falschdrstellungen, Sachfehler und Intrigen aus den USA). Several articles and contact reports have also been published in the following years on this theme. So one should keep in mind that the entire content of the 1998 lecture may not represent Meier/FIGU’s standpoint. 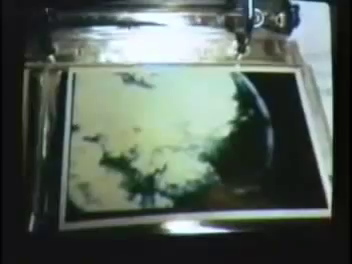 In this video segment originally shot around 1987 or 1988, Wendelle Stevens shows Randy Winters nearly 40 space pictures (it seems not all of the pictures in the album were covered in the video), some of which have already been addressed by Korff in his books. While only a few of these ‘more than 60’ space and time travel pictures documented in Hans Jacob’s photo binder (now in the possession of Kal Korff) and Wendelle Steven’s photo album have been promoted as genuine even to this day since 1975, most, if not all of them (including the ones that we address on this), most likely have been promoted as genuine at least up to the year 1978, the year in which Meier allegedly reported for the first time that these space pictures have been recalled by the Plejaren/Pleiadians and were supposed to be destroyed. The exact reason for the recalling of these space pictures, either deliberately or not, apparently wasn’t mentioned by Meier or FIGU in any of their books or articles since 1978 and as far as we know, only did implicitly for the first time by Meier in 1998 in response to the Asket-Nera photos exposé. They point their fingers at the alleged Men in Black (MIB) and also at the malicious ETs living under the Giza pyramids, called the Gizeh Intelligences or Bafath, who according to Meier have been involved in falsifying his evidence and discrediting Meier and his mission at all costs. Since around 2001, it was revealed that a bulk of these ‘more than 60’ pictures haven’t been considered to be genuine anymore (pictures there were either promoted or presupposed as such in earlier times) by Meier/FIGU, as they do not appear in the set of 42 genuine or almost genuine photos that were allegedly verified and authenticated by the Plejaren Ptaah. In the recent 3rd edition contact notes – Plejadisch-plejarische Kontaktberichte Block 1 (2002) & Block 2 (2003) – only 31 of these 42 pictures have been published. On this page we will be analyzing only those Meier’s space and time travel pictures, that haven’t been addressed before by us and that may or may not be a part of the 42 genuine or almost genuine space pictures. 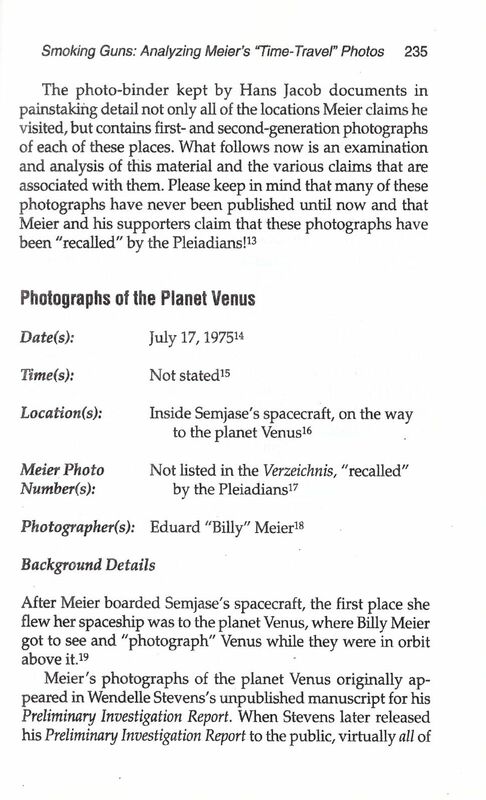 Regarding the space and time travel pictures which Korff analysed in his 1995 book ‘Spaceships of the Pleiades’, on pages 235-240 and 265-268, he presented his analysis of Meier’s photos of the planet Venus and an Alien spaceship. 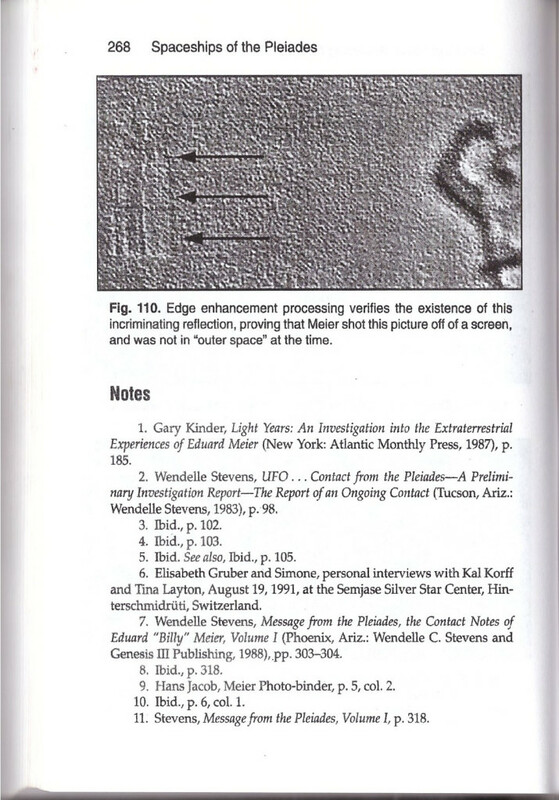 When the FIGU Core Group member and SSSC facility director, Christian Frehner published a rebuttal to the claims made by Korff in his 1995 book in FIGU Bulletin 14 (Feb 1998), for some reason, he evaded responding to all of the Korff’s revelations on the space and time travel pictures, except the Ring Nebula picture. 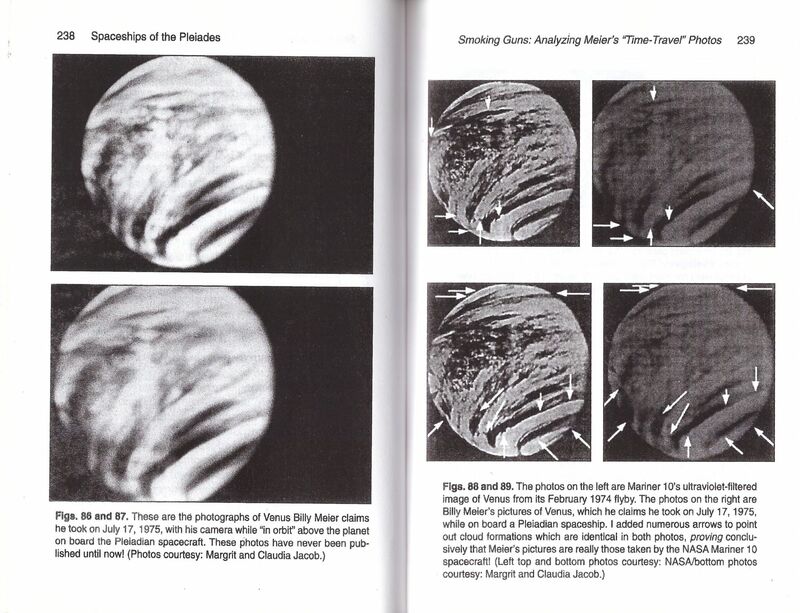 It is interesting to note that in Contact Report 68 (November 12, 1976) Meier defended his Venus pictures (along with his Mars pictures) by saying that these were not photographed by him from TV in 1976, as critics claim, but were photographed by him from space in 1975, which the Plejaren Semjase acknowledges and admonishes Earth people for unable to think “logically.” But as Kal Korff has revealed above, these pictures of Venus have, without a doubt, been photographed by the Mariner 10 spacecraft in February 1974, (to be exact on February 6), more than a year before Meier’s pictures were published. One minor correction in the above Korff’s response (pg. 266) is that according to the contact reports there is no contradiction regarding Wendelle Steven’s account on the duration of Meier’s space jouney (5 days vs. 30 hours). In Contact Report 34, Ptaah and Semjase explains to Meier that after his space journey is over, they would be travelling back in time so that they would arrive back on Earth only 20 hours after departure*. * CR 34 mentions ’20 hours’ (UET Vol. 7, pg. 627 and PPKB Block 1, pg. 420; but ’24 hrs’ in MFTP Vol. 1, pg. 369) as the time that elapsed on Earth between Meier departure and return home on July 20, 3 days after he began his journey on July 17. But according to other sources like this witness testimony, while Meier spent 5 days (from July 17 to 22) for his space journey, his absence on Earth was only 22 hours. 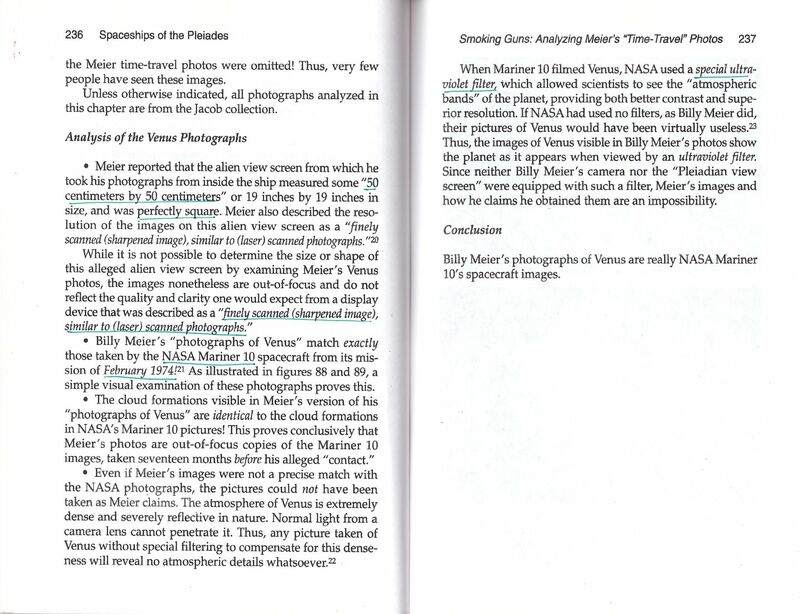 In this section we would be analyzing frames taken from the Randolph Winters video segment originally recorded around 1987 or 1988, where he and Wendelle Stevens goes through Wendelle’s photo album containing Meier’s supposed space and time travel pictures. 63. In a few minutes the final maneuver (BMUFOR note: of Apollo-Soyuz docking) will begin. 64. Start taking the photos already… I will also help you later. 65. After the joining of the two capsules, which will take place soon and very quickly, you will also be able to photograph several satellites, of both terrestrial and extraterrestrial origin. 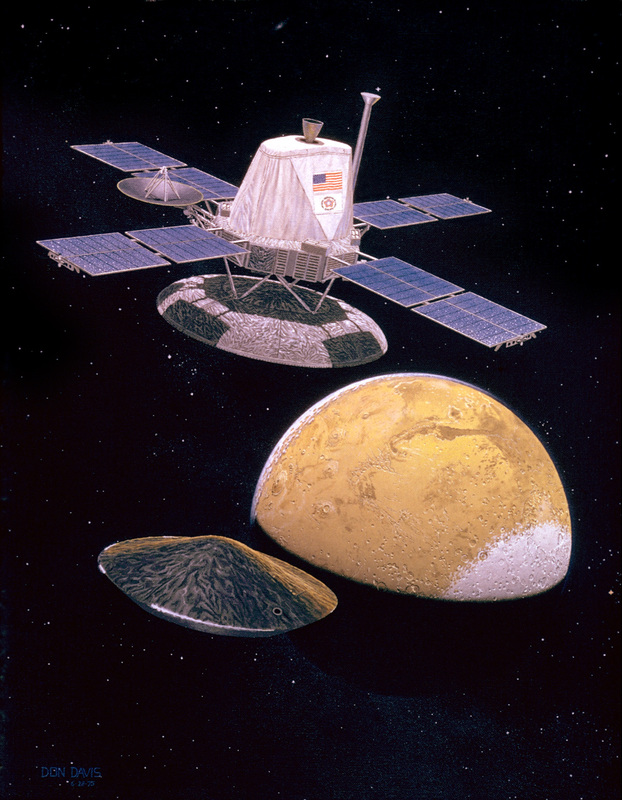 Did Meier photograph the Planet Mars with the secret terrestrial-satellite in space? 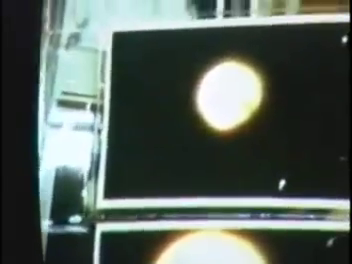 As it turns out, Meier’s picture is in fact a frame from a NASA documentary from the mid-1970’s featuring an overview of the Viking 1 and Viking 2 Mars landers and orbiters mission, which were planned to be launched on August 20, 1975 and on September 9, 1975 respectively, which makes it impossible for Meier to have photographed them in space, several weeks before on July 17, 1975. Could this Meier photograph be at least a genuine one taken of Planet Mars with a secret terrestrial-satellite in space? Although we haven’t found an identical image, the features of the craft on this picture, when compared with the above NASA artwork and animation including this one, clearly indicate that it is either an animation or an artist’s impression of a Viking probe from the mid-1970’s. Also note that in all the animations and artwork we could find online, the orientation of the US flag is upside down compared to the real spacecraft (Viking 1 and Viking 2) that went to Mars. In Contact Report 34 (September 14, 1975) Semjase explains to Meier that the Bermuda Triangle is a place where under certain circumstances a natural portal to other worlds in other dimensions forms. At the end of Contact Report 38 (November 13, 1975) Meier asks Semjase about the world in the other dimension. Semjase explains that there are many dimensions and many worlds and it would be too much to describe them all, but she mentions a dimension where 3 worlds coexist: a primeval world, a world covered in a mantle of vapor and a world quite similar to Earth. According to Semjase, due to the dangerous close pass by of Venus with the Earth 3,500 years ago, the two planets (the primeval planet and the “fog” planet) in two different dimensions have been dragged into the dimension of the fully developed Earth-like planet. 242. 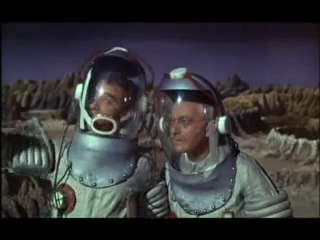 But I will arrange everything and have a protective suit made for you. 243. If you do not mind, I’ll photograph you in it. This would be a picture – perhaps together with your father? 244. That can certainly be arranged, because he’s not active on Earth and doesn’t have to fear recognition. A few weeks later, on December 3, 1975 as described in Contact Report 39, Meier allegedly made the promised journey into the other dimension with 3 worlds, together with the Semjase and her father Ptaah. First they visit the primeval world on which dinosaurs live, and Meier has the opportunity to make photos on this world, including a photo with Ptaah who insisted that his picture should only be shown to Meier’s group and not to the public as he might have to move on Earth occasionally and someone could recognize him. The pleasure is all mine. But how is it with this: Semjase told me that we can do some walking on this primeval world. 3. We let a suit be made for you, by which you can take photographs. Semjase already told me that. I would also like, then, a photo of you and me in the suit. 4. You may not distribute my picture, however. 5. It must be, unfortunately, because I might still have to move on the Earth once in your time. I understand; you don’t want to be recognized. 6. That is so; it is a precautionary measure. 226. Also regarding the pictures of me, I must ask you not to spread these and to show these exclusively in your group. 227. You shouldn’t make any photos of these and should let the matter rest exclusively with slides, which should remain in your own possession. 228. Originally, this wasn’t planned in such a way, but there is now the possibility that, on occasion, I will have to move on the Earth, protected by a vibration device; thus, someone could recognize me, which may not be allowed, however. 229. It was already a major exception that you were allowed to take photos of Asket and Nera, and by the way, in the meantime, we’ve found female Earth human beings in America, who look deceptively similar to them and who, interestingly enough, also work together in a community of interests. While Meier seems to have acknowledged stating in the contact notes about an event where he photographed two moons of a prehistoric Earth which no longer revolves around our planet at present, so far we couldn’t find the specific contact report in which he mentioned about this. If the above information is incorrect, then perhaps the right description of the above picture could be the one that is present in CR 39, where Meier (after travelling to another dimension through the Bermuda triangle), standing on the primeval world points to and perhaps photographs the two other worlds (a world covered in a mantle of vapor and a world quite similar to Earth). 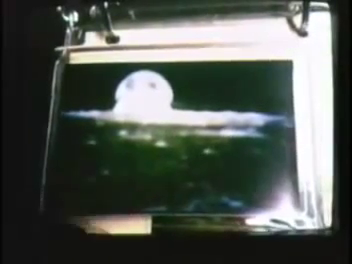 In any case, this picture is identical to a transition frame (where one frame fades slowly into another) from a video showing sequential snapshots taken of the Earth rising above the Moon’s horizon, as documented by the Apollo space crew, in or before 1972. The last Apollo manned spacecraft was called Apollo 17, launched on December 7, 1972 and the crew returned to Earth on December 19 of the same year. 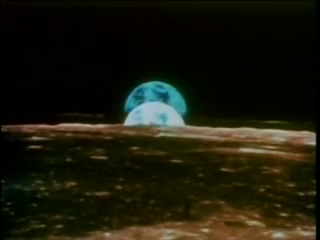 That footage is available in this documentary – ‘The Space Movie’ – from 1980. See below clip at the 4:03 min. mark. Any person who has been following or aware of the US space programme or with a basic knowledge in Astronautics could right away recognize the objects in the Meier’s picture as being Skylab and Apollo CSM in docking position. 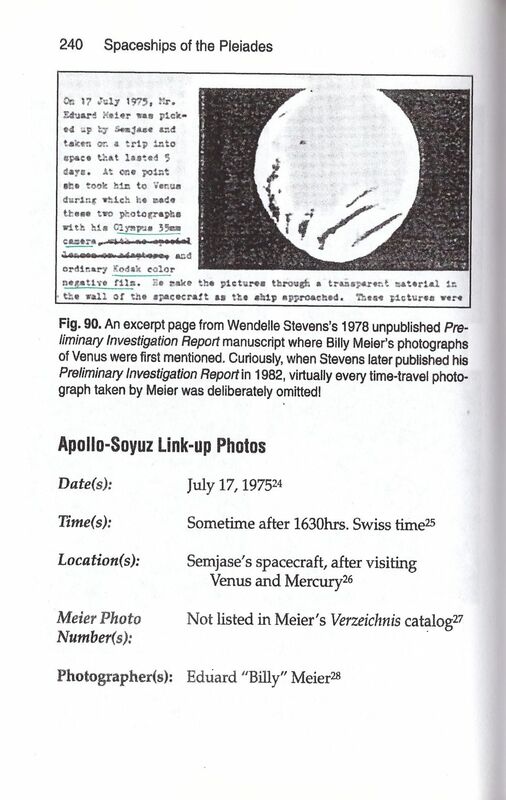 As mentioned earlier, in CR 31, Meier did mention that he was allowed to take photographs of “several satellites, of both terrestrial and extraterrestrial origin” soon after he finishes photographing Apollo-Soyuz docking on July 17, 1975. So one might think that the above photo could have been taken by Meier of Skylab and Apollo CSM in docking position on July 17, 1975, the day when Meier began his Great Journey into space with Plejaren. But there is one huge discrepancy. The fact is, even though the first American space station Skylab operated in in space since its launch on May 14, 1973 and up to its crash on Earth on July 11, 1979, the third and the last manned mission using the Apollo CSM (Skylab 4) spanned a duration of 84 days from November 16, 1973 to the February 8, 1974, when the last Skylab crew returned to the Earth. 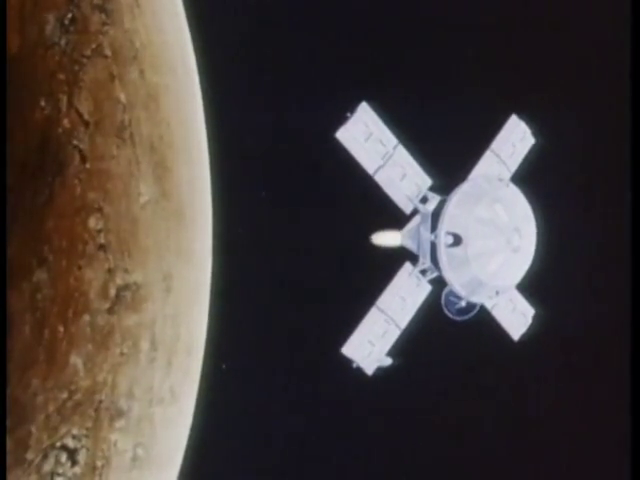 If Meier started his journey on July 17, 1975, it is impossible for Meier to have photographed Skylab and Apollo-CSM in docking configuration, since there was no Apollo-CSM in space at that time, except the one that was already in docking position with Soyuz 19. Then how could Meier have photographed Skylab-Apollo CSM? Did he travel back in time to 1973 or 1974 and photograph them in docking position? The answer is demonstrably no. 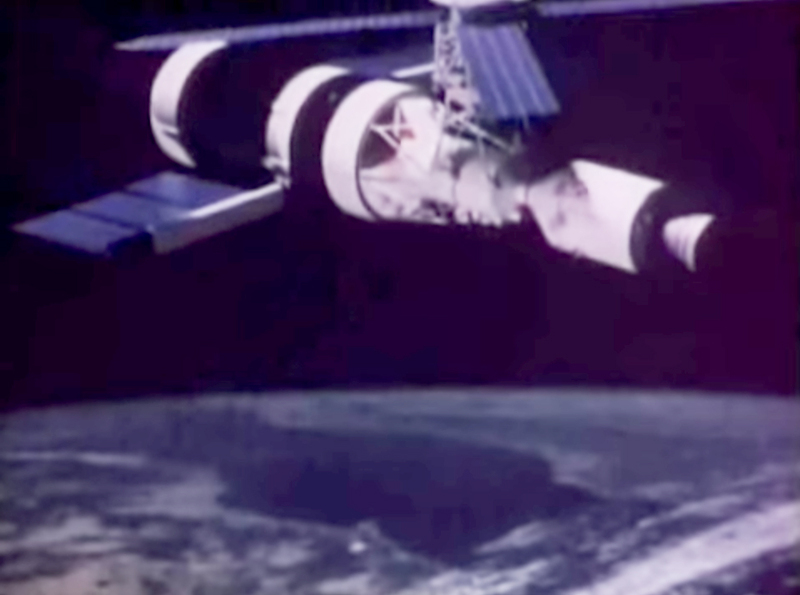 As it turns out, again, Meier’s picture is identical to a frame from the NASA animation that shows the simulation of the docking of Skylab space station with Apollo-CSM from early 1970’s. 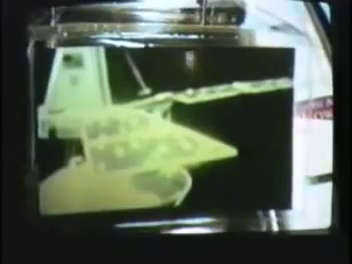 The following frame (right) from the 1971 NASA video titled ‘Aeronautics And Space Report For 1971’ clearly indicates that Meier’s picture definitively must have come from the complete version* of this same NASA animation. 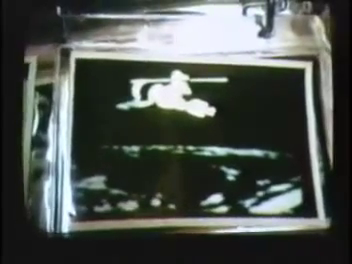 * The Skylab’s Apollo Telescope Mount, visible in Meier’s picture, is not fully visible in the 1971 NASA video as the scene suddenly cuts to a different one right at the desired identical frame. 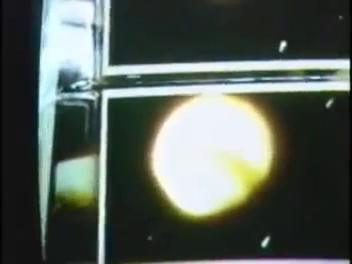 We have looked into a few of the other 1970’s NASA videos (see below) that shows more scenes from the same extended animation, but we couldn’t find the required frame that is identical to the Meier’s picture in those videos. If you find the exact frame, please let us know. One of the out-of-focus pictures used by Meier was traced to its original source, a drawing of the interior of a futuristic space station* published in a magazine. Examined side by side, the two pictures were identical. * likely not referring to the Meier’s Universal Barrier photo, since it is also mentioned later in the same article. 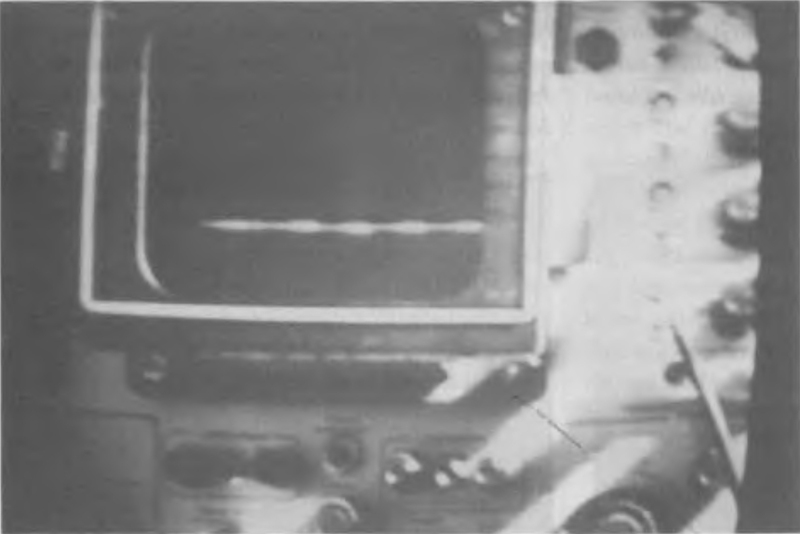 This Meier’s image of a supposed beamship monitor device is eerily similar to a terrestrial oscilloscope (see below). We have published a more thorough analysis on this picture here. All of the above three pictures are of Mars. 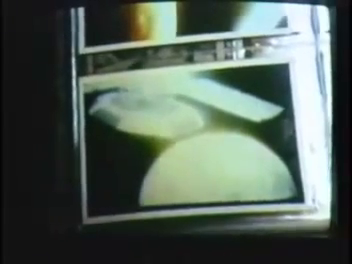 According to Contact Report 68 (November 12, 1976) pictures of Mars that are identical to Meier’s pictures have been shown on TV in 1976. 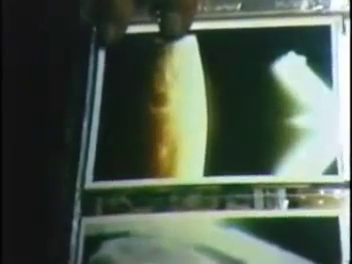 Meier in response (CR 66), argued that the reason for his Great Journey photographs of planets Mars including Venus and Jupiter (allegedly photographed in July 1975) being identical to the images of the same planet(s) shown on TV in 1976 is due to the fact that they have been very accurately imitated by the dishonest artists. But from the investigation so far done into Meier’s space pictures, it is very likely the case the images of these planets existed long before Meier published his. There are still a few dozen Meier’s pictures taken from his alleged space and time travels, that haven’t yet been analysed. If you are interested, please go through this link which documents photos that are considered to be genuine by Meier, either from 1975 and still to this day or at least up to the year 1978. We have investigated a portion of Meier’s pictures that were allegedly taken by him during his space and time travels undertaken with the Plejaren in 1975. Even though these pictures may or may not be a part of the set of 42 genuine or almost genuine space and time travel pictures that have been allegedly authenticated by Plejaren Ptaah in around 2001, these have been either promoted or presupposed as such up to the year 1978. From the photos that have been analyzed on this page, we have revealed that the true source of Meier’s pictures as being not extraterrestrial as Meier claimed or may still claim, but purely terrestrial like NASA photos and videos and a British comedy film. 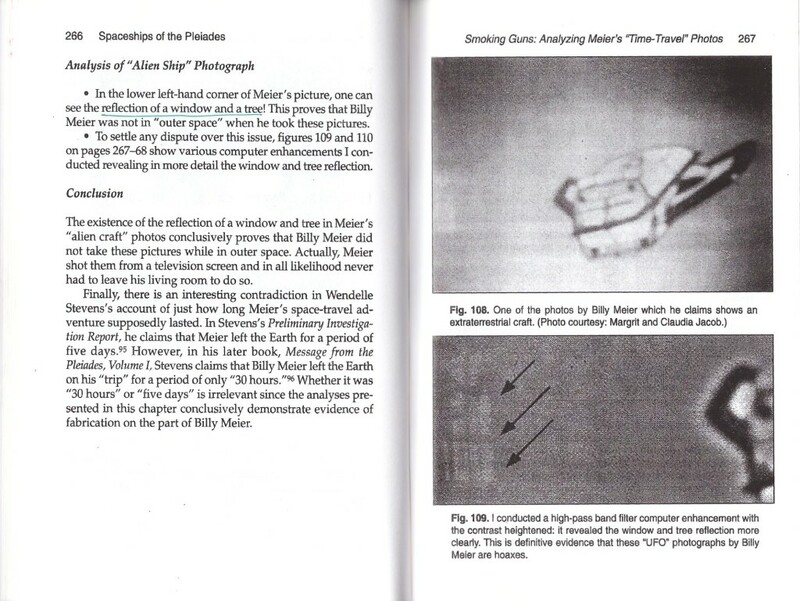 Older: Billy Meier’s Space and Time Travel pictures – Real or Fake?